Seastrom Manufacturing - D shaped hole washers in cold rolled steel. 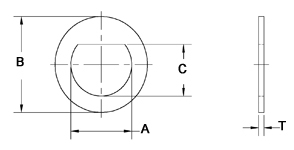 D shaped hole washers are designed to prevent the washer from turning relative to a D shaped shaft or rod. Need a different finish or size? Please submit a quote below.